Billy Milne DCM (apparently known as “Stig” – for reasons that I have not been able to ascertain) was born on 24 November 1895 and had an unusual career at Arsenal. He played before and after the first world war for Buckie Thistle, and during the war served his country with great honour with the Seaforth Highlanders in France, for which he won the Distinguished Conduct Medal in 1918. (The DCM is an extremely high honour, given for bravery – the second highest award of its type for the “other ranks”). He was taken on trial as a wing half by Leslie Knighton, and signed for Arsenal in September 1921. Milne made his début for Arsenal away to Cardiff City on 27 December 1921. Billy Milne’s first match was a typical Knighton affair. Not only did he play in his first game, so did Turnbull while Dr Paterson made his first appearance of the season, and Joe Shaw (who was now very much at the end of his career) was brought back at right back. The crowd for the game was recorded as 37,000. Of course some change was needed – Arsenal had already played Cardiff on Boxing Day at highbury (0-0) and before that had lost 0-1 to Oldham on Christmas Eve. For the game on 27 December it was Cardiff 4 Arsenal 3, leaving Arsenal with 3 defeats and 3 draws in the last six. They ended the season 17th. Overall Billy played 114 league games and 10 Cup games for Arsenal, mostly for Knighton, but failed to cut it with Chapman. His final match was the home defeat to Huddersfield Town on 2 April 1927 (not against West Ham as reported in some circles) in which he broke his leg – only his sixth appearance that season. Just as the start of Billy’s career came during a poor run for Knighton, so the last game came during one of the worst runs of Chapman’s regime at Arsenal – the fourth of six consecutive defeats – a run which included away defeats of 1-5 to Sunderland, 1-6 to Newcastle and 0-7 to West Ham. However despite not playing again Billy stayed at Arsenal – an unusual (perhaps unique) event for a player who was at the club but not valued as a player by Chapman, and indeed he went on to work his whole life for the club. After recovering from his broken leg Billy became assistant trainer to Tom Whittaker – and in 1947 became the first team trainer. It is reported that it was Billy Milne’s commitment to fitness, and his attitude on the pitch that led to Chapman retaining him as assistant trainer, and clearly those who succeeded Chapman felt much the same. According to Wikipedia, during the second world war Billy was an ARP warden at Highbury and was on duty the night Highbury was hit by an incendiary device. Milne helped put out the fire, and saved the stadium from serious damage. Milne continued to hold the assistant trainer’s position until Whittaker himself became Arsenal manager in 1947, upon which Milne became first-team trainer, and later club physiotherapist – a post he held until Bertie Mee took over in 1960 upon Billy’s retirement aged 65. Billy was thus part of the club from Knighton to Swindin – probably the only man to be so involved. He passed away in 1975 after a lifetime of service to the club, at the age of 79. Below is a list of players used by Knighton in his last two seasons, and Chapman in his first two – and it shows how in many cases Chapman took the Knighton players and continued to use them. This was not the case with Billy Milne, as we have noted – and yet as an employee of Arsenal he outlasted them all! A really interesting piece regarding my grandfather and nice to see an article on him in the match day programme against Arsenal last year. Does anyone know if there is anything on him in the Arsenal museum?? The other thing was, that I have never seen a photo of him in his playing days, does anyone know of one in existence?? 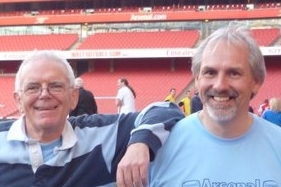 Jonathan, he was my grandfather too and because I am about 15 years older than you, I was able to spend a lot of time with him at Highbury as I was growing up. I have quite a lot of old photos. Perhaps we should get together after all this time? Also, for reference, he was not known as Stig, but “Stir” . I never had a good answer as to that either though. Jean/Jonathan – if you want to get in touch with each other but dont have email addresses I can send yours to the other. Hi there. I am the club historian for. Buckie Thistle FC and a friend of mine, Neil Smith alerted me to the article on your website on Billy Stir Milne and I was fascinated by this and the comments from his descendants. Neil is doing a book on players for the Jags who went on to serve with big clubs and has a lot of information on Stir. Neil is not on e-mail but they can contact him on 07977 583137. Alternatively he can be contacted via a message to my e-mail address so please pass that on to the folks. I would love to hear from them also. My number is 07813 534715 though house am in has no mobile signal, I. Odd place for a family reunion, but if you could pass on my e mail to Jean Ward it would be much appeaciated (I’m Jon’s brother and Jean’s Cousin). Thought I would like to add to the conversation. The late Billy Milne was my mother’s uncle. When she was a teenager he gave her his Arsenal FC medal. I have this medal. She used to talk very fondly of him, and I remember meeting him at a family wedding. My mother was Elizabeth (Bette) Munro, nee Wilson. She was the youngest of three sisters.